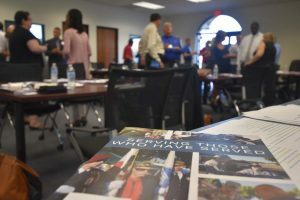 On August 15, Santa Barbara County business owners and hiring managers gathered to learn about recruiting veterans for employment in the community. Why Hiring Veterans Makes Sense was led by Sara McNamara, MSOD, Consultant and Military Transition Strategist, who specializes in matching veterans with professional level job opportunities. McNamara facilitated a discussion covering the challenges faced by veterans during the transition from military service to civilian employment. It was followed by a networking session where employers and veterans held conversations with one another. The Santa Barbara Foundation coordinated the event to address issues identified in the 2017 Santa Barbara County Veterans Needs Assessment. The report concluded that although veteran unemployment is low, there is a significant issue with underemployment. Veterans often accept positions for which they are overqualified, rather than being unemployed. Further, employers value the discipline and work ethic that many prior service members bring, but are unaware of how to connect with the veteran community. Likewise, veterans often struggle with effectively translating military experience to the civilian job sector. The event served as an effort to bridge this gap. During the networking session, employers spoke one-on-one with veterans and active-duty service members. It allowed for a unique encounter with the veteran community. McNamara was delighted to see the enthusiastic conversation among participants during her presentation and the networking session.